FAQ or Issues with syncing? 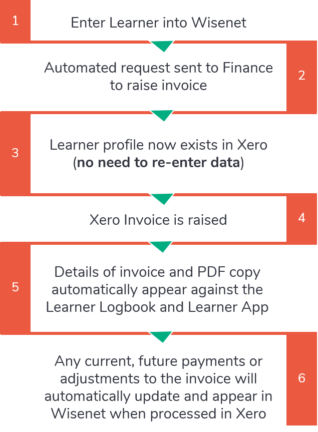 The Learner Invoicing Process involves syncing Learners to an accounting application that is supported by Wisenet so you can generate invoices and, syncing them with payments back to Wisenet. At Wisenet we believe that our expertise is in the areas of Learner Management and want to keep it that way without complications of trying to add a complete accounting system into Wisenet. We have performed extensive research into many online accounting applications before we partnered with Xero , and with such great products, why re-invent the wheel? Working alongside Xero means that we can offer our Customers the best of both worlds. The result is an integrated solution to your Learner and financial data that is cost-effective, intuitive and seamless. Learn more about Xero’s Features and Tools . Understanding how the integration between Wisenet and Xero works will help you with applying the payment process after you set up your Xero Integration. Our Integration Platform is designed to allow for optimised workflow and the sharing of data and information between each application. This is a one-way sync because contact details that are updated in Xero will not sync back to Wisenet. Once invoicing, such as Credit Notes, Payments, Pre-Payments and Over-Payments, is completed in Xero, you can view the invoice details, including the invoice PDF in the Learner’s record by clicking on Xero Invoices from the Left Navigation Bar in Wisenet. Learners can also see a copy of their invoice(s) in the Learner App. All documentation is saved in one place (in Logbook) for quick and easy access. As a customer of Wisenet, the Xero Integration license is automatically added to your product and service package with us. If you already have Xero contacts that should be linked to a Learner in Wisenet you will need to complete the Xero Integration set up and merge records to Xero. If you do not see the option to connect Xero on the LRM then log a support request. NOTE: You require Admin access to complete this set up.